As fun as summer is, it can also be exhausting! Whether you have been at the beach all day and are wiped out from all the sunshine or you have been trying to wear out your kids and have managed to wear yourself out too, some nights you just don’t want to deal with the hassle of cooking dinner (if you are staying somewhere with a kitchen) or wading through traffic, reservations, and crowded restaurants. Some nights, you just want to stay in, have something quick and easy, and watch a movie or play games (or pass out!). If you ever feel like that, you might want to know where to go to get something great, so here are some of the best places to go for take-out on Cape Cod! RC’s doesn’t only make pizza. You can get wings, various appetizers, or even subs! RC’s is inside Peterson’s Market, so you can pick up all the necessary items for dinner (paper plates, drinks, dessert, berries, whatever you’d like). Peterson’s also has beer, wine, and liquor, so you pick up all the necessary after dinner items as well! RC’s also has a new location at the Barnstable Market. While Zia is great for take-out, they also have seating and serve beer and wine, so Zia can be a great place for a casual night out. The Corner Store is open from 6:30am to 6:30pm, so if you are thinking of a late dinner, they might not be on your list, but if you are looking for tasty take-out for the beach, an early dinner, or even breakfast (their breakfast burritos are scrumptious), then this is the perfect stop! Another notable pizza place in Provincetown is Spiritus Pizza on Commercial Street. If you are in the mood for sit-down dining, the Double Dragon also has some of the most potent libations on the Cape. The eponymous “Cricket” is also right next to the Nauset Fish and Lobster Pool, so stop in and pick up some fresh seafood there if you are so inclined. 7. Red Barn Pizza, Eastham: Another pizza place that has large pizzas that are actually 18”, the Red Barn not only has succulent food for take-out, but ice cream as well. If you are waiting for pizza, you can even enjoy a glass of beer or wine. So if the go-go-go pace of your vacation has you wishing for some respite, consider one of these wonderful take-out spots, pick up the phone, and order out for the perfect night in. 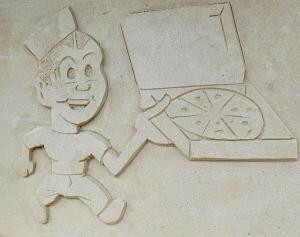 The sand sculpture in front of Peterson's Market in Yarmouth Port says it all: PIZZA! Photo by Maggie Kulbokas.